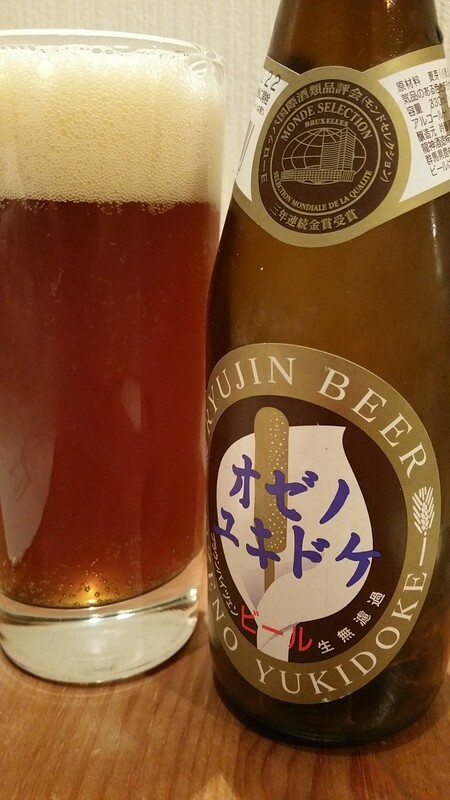 Ozeno Yukidoke Brown Weizen is a dunkelweizen, aka a dark wheat beer, produced by Ryujin Shuzo out of Gunma, Japan. One of my friends picked this up for me on a recent onsen trip. Well, I say picked up. More like, “here’s a picture of a beer I’m drinking while you are at work!”. Ozeno Yukidoke Brown Weizen is also an award-winning beer too, having “won” a medal at the monde selection awards. Trust me. That award doesn’t mean much. An award-winning beer. Well, except the award doesn’t mean that much. Ozeno Yukidoke Brown Weizen had a dark tan coloured body with a fairly light and frothy head to it, but it didn’t last long until it deflated into the body. There wasn’t much of an aroma coming off of Ozeno Yukidoke Brown Weizen either, just some subtle notes of yeast and a smidgen of sour lemons, and an even fainter note of toffee. I was bloody grateful my cold had cleared up, else this review would have stopped after the first line. The body though didn’t really match up with the aroma. Ozeno Yukidoke Brown Weizen’s taste was much stronger than the aromas, perhaps the cold was still lingering? Roasted malts with an edge of smokiness brought forth some further toffee, verging on caramel, flavours that lingered in the mouth. Ozeno Yukidoke Brown Weizen felt creamy, not a lacto level of creaminess but not buttery either, and ended off sweet. Ozeno Yukidoke Brown Weizen is not your usual dunkelweizen and is a difficult one to pigeon hole. If you see it, try it and let us know. I could do with another to check. Ozeno Yukidoke Brown Weizen can be bought at Nomono in Akihabara and also Le Collier in Tokyo Station. Besides those two places, good luck. The website for the brewery comes up blank too. I am not sure what Ozeno Yukidoke really wants to be. Neither the Brown Weizen described here, nor the White Weizen that I have also had, are a weizen. Why do they call it a weizen? No idea. Both of their beers are rather a kind of vienna style lager, or oktoberfest bier, or a maerzen, or a maibock, but definitively not a weizen. The Brown Weizen had a relatively strong caramel taste (or was it the White Weizen? ), that’s why I feel it is one of the German styles described above. Maybe brewed like a wheat beer, but the taste is not a weizen. I have had it one recently, and once about a year ago, same impression both times.